While it may start to sound like a broken record already with the weather forecast this week, we’ll continue to post severe winter weather for your safety on local and rural highways. 10 cm of snow expected for Prince George by late afternoon and additional 5 tonight, with the heaviest snow accumulations north of the city. For BC North and the Pine Pass area, 15 cm is expected by the end of today. An approaching Pacfic front will track across the BC interior today while the arctic front lies just south of Prince George. 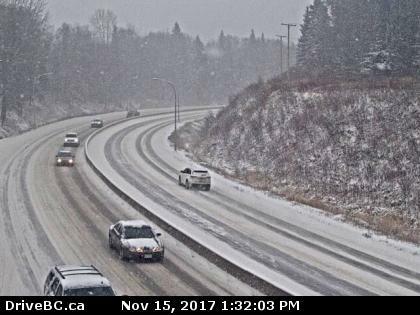 Significant snow is forecast north of the arctic front for the BC Peace, Williston, Prince George and Fort St James where 10 to 15 cm are expected today. The snow will taper to flurries this evening in the wake of the front.